Unbeatable price per power output. Hornet super plus wind generator, choose any voltage. 12,24, or 48,60v. This super plus 8 KT blade hornet 8 blade large multi fixing hub. Supplied with mean green 715mm blades, picture show the black same size, now we use the stronger green blade. This is a new design hub made in the UK by wind generator. The hub is heavily chromate zinc gold color plated and comes with. Will survive in extreme conditions. Mounting bracket is extra heavy duty 5 mm steel made to fit 3 pole. Bracket and tail and heavily power coated. 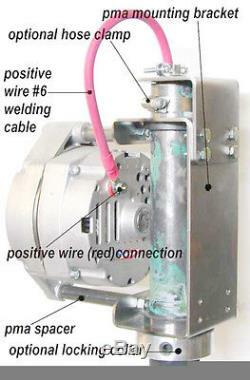 PMA/G will make up to 1500+ watts of good power. Ideal to charge battery banks or feed into a grid tie inverter. This turbine is made to last. See power wind speed test at. We make the blade sections and hubs to extract. Items you need to fit the wind turbine. Tower to suit your location make it strong and fit guy wires. Copper core cable 10 awg multi strand battery cable more strands of copper carries the volts and amps better. Inline fuse and breaker switch fuse protects shorts and over loads, protects generator unit, generator is very power full no fuse you loose!! Take note take time to fit all components, 1 man can easily fit this turbine, with guidance from meb. Battery bank or grid tie You will need a battery bank or inverter to suit your needs. 10 mm and 17 mm 24 mmners or sockets , wire crimps. Crimp all wire connections, do not solder, use heat shrink over connectors. Do not connect turbine to charge controller!! A charge controller is a device that turns off. If this wind turbine is turned off in high wind using a controller then the load will blow fuse or even damage. Keep power flowing to battery bank, fit a dump relay to battery to divert excess power away from battery. You can use water heater, lights, air heater with a dump load relay. Once turbine is fitted correctly then it will last for years. We have spares always in stock at good prices some parts may vary in color. 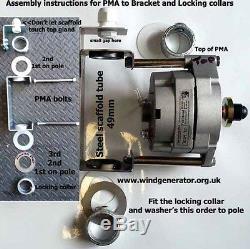 Best help and advise given, I want you to have knowledge to fit and look after your turbine. The item "Wind Generator UK design Power, Strong, survives high winds heavy duty 12/24/48v" is in sale since Friday, June 17, 2016. This item is in the category "Business, Office & Industrial\Industrial Tools\Generators". The seller is "hornet-bestturbines-uk" and is located in Huddersfield. This item can be shipped worldwide.